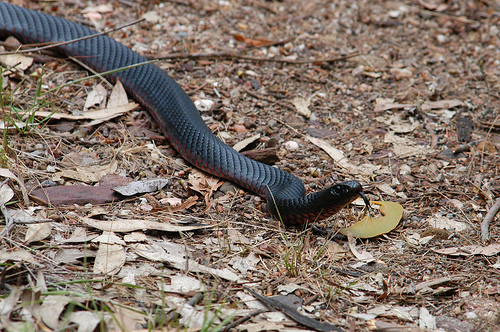 Red bellied black snake is found in the wetter south east of Cape York. It is a well known snake in Australia, because of its distribution in the south eastern parts of the country, including urban areas. Up here it is found in two isolated pockets - one south of Townsville, and one north of Cairns. The Cairns population covers the coastal area from Cairns to Daintree rainforests and Cooktown, as well as parts of Lakefield National Park. 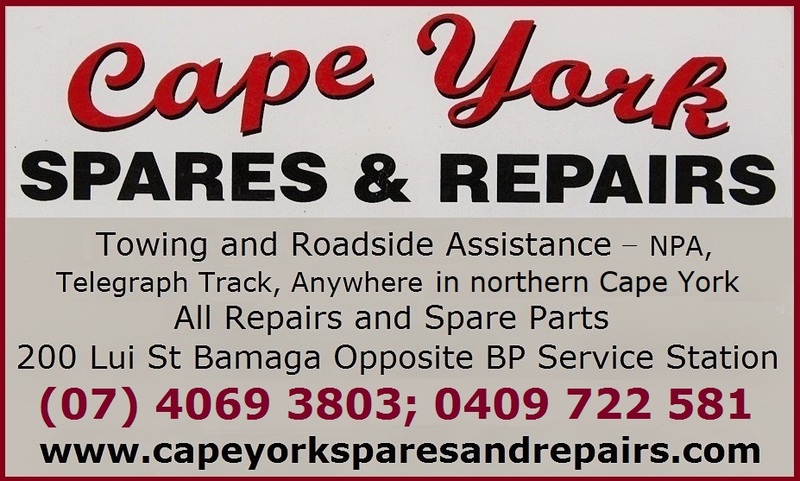 So it is not common on most of Cape York peninsula, and neither is it quite as dangerous as most other Australian poisonous snakes. Its venom is weaker, and there are no reports of it having killed a human. That said, it is venomous and its bite should be treated seriously. 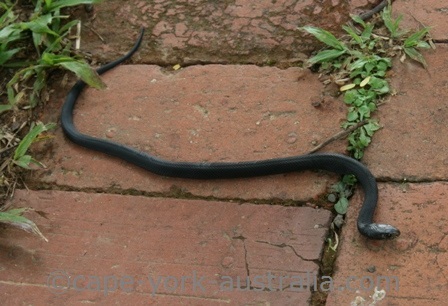 It can be one and a half to two metres long and is one of the larger Australian dangerous snakes. 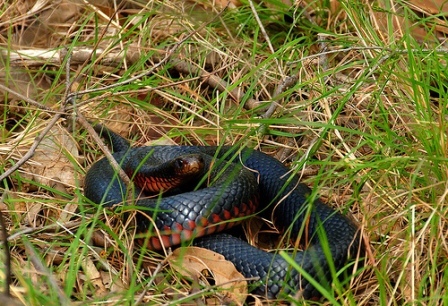 It is also one of the most beautiful, with a glossy black back, and a red belly. The sides of the belly are the reddest, and the underside of the belly is often pinkish white. The underside of the tail is black. It has a small, streamlined head, and a lighter, brownish snout. 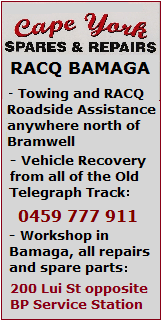 It is mostly found in south eastern Australia (eastern half of New South Wales, most of Victoria, eastern South Australia, south eastern Queensland, and two pockets in north Queensland - one south of Townsville, and one north of Cairns. It lives in many different types of habitat, including rainforest, open forest, woodland, bushland and open plains, even people's gardens, but mostly if they are near a water course. This snake likes wetter, moister habitat and can be seen on rainforest walks, near billabongs, rivers, creek streams, wetlands, dams and other water bodies. It is diurnal, but can also be seen during hotter evenings and nights. When not basking or hunting, it can be sheltering in hollow logs, under roots, rocks and timber, burrows and similar. 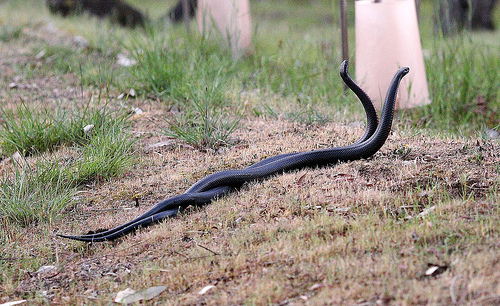 While some snakes focus on small mammals and others on other reptiles, the red bellied black snake is mostly a frog eater (and the poisonous cane toads always kill them when eaten). But it does take a small mammal and a reptile (including another snake), or even a bird or a fish if its gets a chance. Male combat can be seen in the late Dry Season, followed by mating. In the early and late Wet Season between eight and 40, about 12cm long young are born. Red bellied black snakes are different from most other snakes in that they don't lay eggs but give birth to young in membranous sacs. 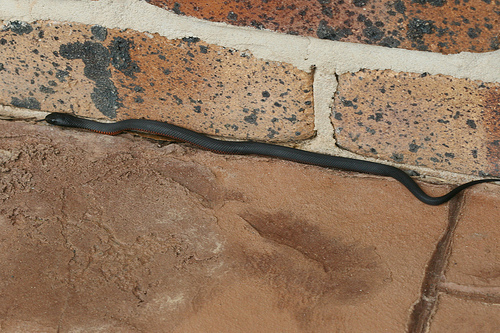 The red bellied black is not an aggressive snake and will first try to escape when provoked. If agitated too much it flattens its neck and hisses loudly. But if cornered, like other snakes it will finally bite. If it does bite, its venom is not very highly toxic, and it does not inject a lot of it, so there are no reports on human deaths. However its venom does contain neurotoxins, myotoxins and coagulants - the human-killing components in the toxin of many other more poisonous snakes. A bite should still always be treated seriously and medical attention should be seeked for antivenom.